For many years, metals like gold and silver were the most popular materials used to repair teeth. Metals are both durable and malleable. However, they come with some significant downsides, including the fact that their color clashes with that of the teeth around them. Dr. Boehmer is proud to serve as a metal-free dentist in Albuquerque. The restorations she provides can protect and restore your teeth without marring your smile’s natural beauty. 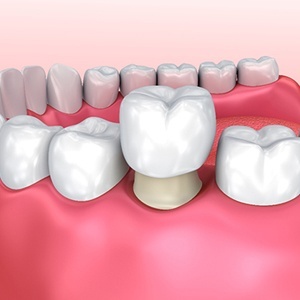 Metal-free crowns, bridges, inlays, and onlays are constructed out of dental porcelain/ceramic, a strong material that closely resembles the look and feel of natural tooth enamel. It can even be shade-matched to the teeth around it so it blends in seamlessly with your smile. But a beautiful appearance is far from the only advantage that metal-free restorations offer. Porcelain-fused-to-metal crowns can be quite lovely when they’re first placed. However, they may cause a thin dark line to appear near your gums over time. All-porcelain restorations do not have this problem. Dental porcelain is biocompatible, meaning that allergic reactions to it are almost nonexistent. It is also non-toxic, meaning that it poses almost no risk to your oral or overall health. Placing a porcelain crown or bridge requires the removal of less healthy dentition than placing a metal restoration. Metal-free crowns may last for 10 – 15 years or longer if you take care of them properly. If you need a metal-free crown or bridge, the restoration process begins when Dr. Boehmer prepares your teeth by filing away a bit of enamel. Then, she uses our advanced scanning technology to take digital impressions of your smile. That data goes to our in-house milling unit, which can create a permanent restoration right away. That’s right — you won’t have to wear a temporary crown, and you won’t have to come back for a second appointment! 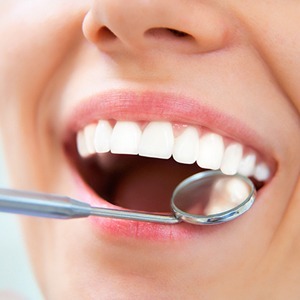 Before Dr. Boehmer permanently attaches your restoration, she will make sure that it fits in comfortably with your bite and that you are happy with its appearance. After it is bonded to your tooth, you can go off and enjoy your beautiful, restored smile. Do not grind your teeth. Grinding and clenching can damage both the porcelain and your natural tooth enamel. Be wary of staining foods and beverages. Although porcelain is resistant to stains, it can become discolored over time. You should enjoy things like coffee and red wine in moderation. Practice excellent oral hygiene. 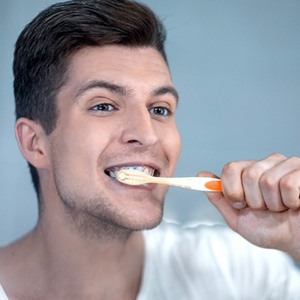 Thorough brushing and flossing can prevent stains and plaque accumulation. Flossing underneath a bridge helps to keep your gums healthy. Don’t bite hard objects. Chewing on ice or using your teeth to open packages may cause the restoration to break. Would you like to learn more about how metal-free restorations may be able to bring back your smile’s strength without downgrading its appearance? Contact our office today to schedule your consultation with Dr. Boehmer, your cosmetic dentist in Albuquerque.